ONE YEAR AGO yesterday, a violent storm ripped through Quincy and caused millions of dollars in damages. We lost a garage, shed and fencing. A huge tree fell on Sheryl's nephew's car. Another tree fell on the front of our house. Yet we were lucky, compared to some. It was awful. We spent the first night in shock and in the dark - power wasn't restored for three days. The next night we stayed at the store, but the couches weren't kind to our backs and we both slept poorly. The power finally came back on and all of Calftown rejoiced. 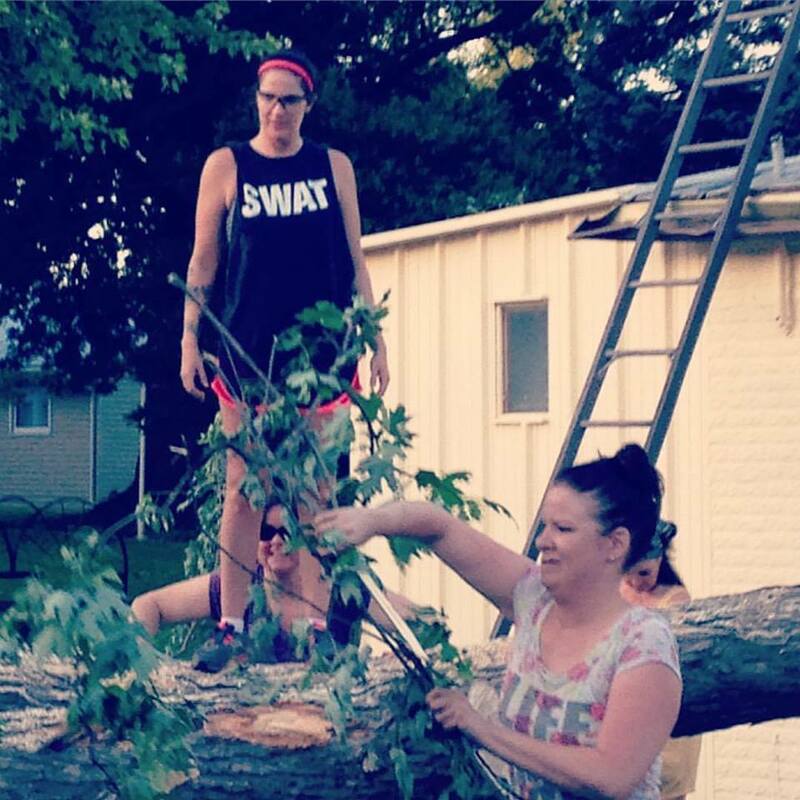 Sheryl peeking out between Cori's legs while Lacey works..
What I remember the most was the night after the storm, when our friends showed up with chainsaws to help clear the huge fallen trees and dig through the rubble. A bunch of our friends showed up and many others pitched in. Our buddy Greg Ellery got on the front roof and used a small chain saw to remove the huge tree branches and didn't cut his arm off or fall off the roof. We were amazed. I remember sitting in the twilight after we were done, sipping a cold beverage and feeling very grateful. Exhausted and grateful. Yesterday afternoon another storm blew through town, albeit not as severe. It knocked out four windows on the upper floors of Second String Music and damaged our porch umbrella. I just laughed - it paled in comparison to a year ago. We have a new garage, shed, front window and front roof. Our fence is still in pieces but will soon be fixed - right, Frank Haxel? The other day I grabbed some firewood and found a piece of the car that was crushed. Sheryl just ordered a solar panel kit to restore power to the garage for a more permanent fix than extension cords. We have almost got the homestead back to "normal". Reminders, everywhere. I prefer to think of the good things that came out of it.